This is a slightly revamped version of my delicious Berry Pie recipe. 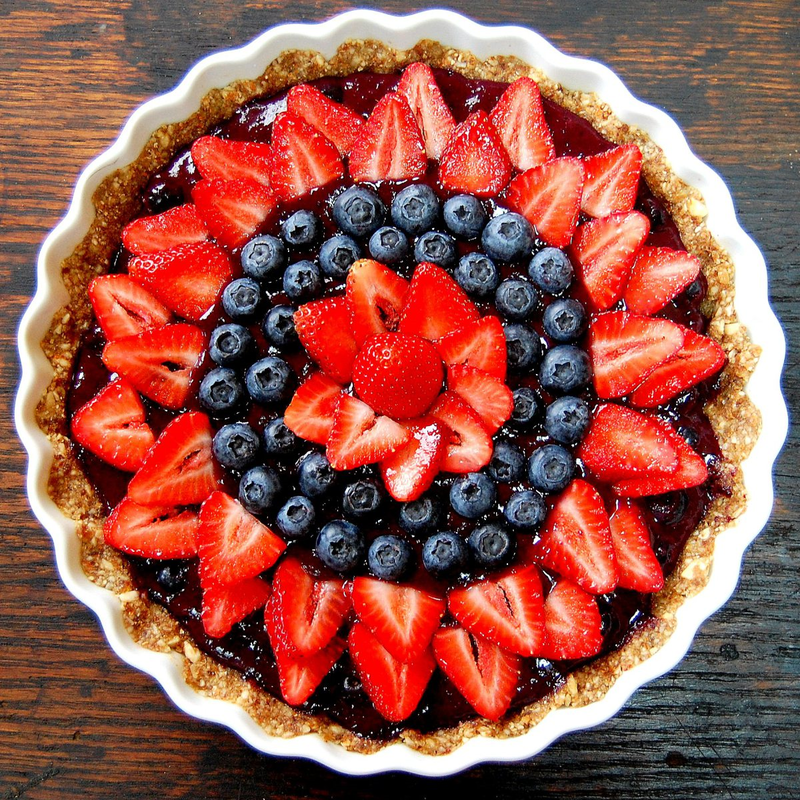 I volunteered to bring dessert for Easter Sunday and my mother-in-law – this is her favorite – ­ is happy to know this Berry Tart will be showing up. When I originally made this I used my ceramic pie dish knowing I wanted this to be a tart from the beginning and of course min-tarts for a dinner party. I’m just going to buy those cute things instead of waiting for my birthday because you know I love making all things mini. Mini-treats of all kinds just taste better to me – so cute and delish. With mini-desserts, I can have my beloved treat and most importantly, not overindulge. I had this ceramic tart dish sitting in a box and had completely forgotten about it – you see it was packed away in the basement from our move. I was elated when I found it recently and couldn’t wait to make this again. It looks way prettier this time, don’t you agree? The recipe is basically the same as the original. This time I only mixed blueberries into the pie filling and saved the strawberries for decorating. I would also like to add kiwi and/or raspberries to this next time. 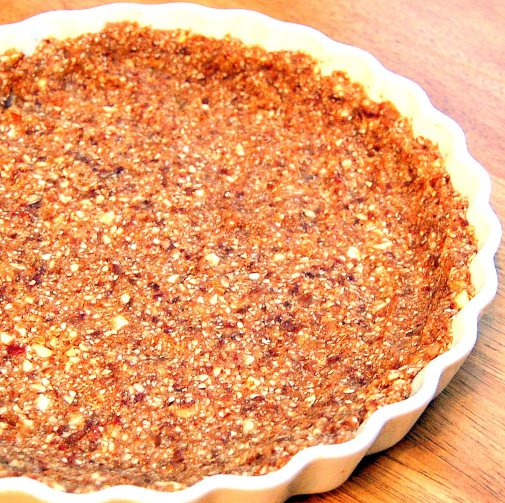 You can substitute your favorite nut for the crust if you don’t like almonds. Pecans would be awesome in this, or you can use mixed nuts as well. This tart has a creamy, irresistible texture with just the right amount of natural sweetness that will have you going back for seconds – you might even have to hide the leftovers for yourself. This Berry Tart is also antioxidant rich and full of many health benefits – you wouldn’t see a recipe here that wasn’t great tasting and also great for you. All in all, this tart is completely fabulous. 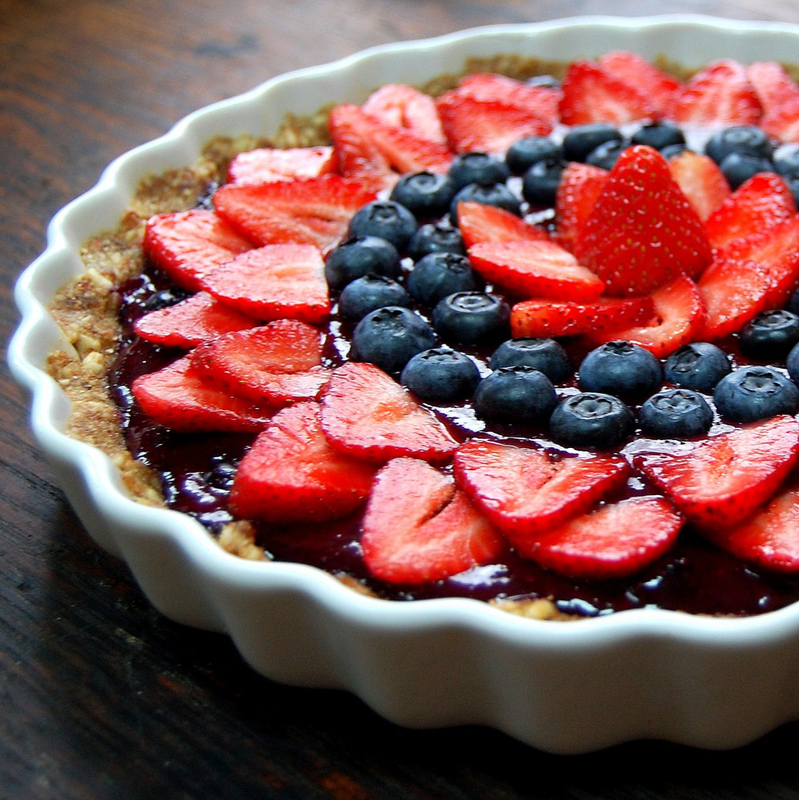 I can’t wait for everyone to dig into this berry tart today. I encourage everyone reading this to make this, you will not be disappointed. This has been added to my go-to dessert recipe and it will probably be added to yours. 1. 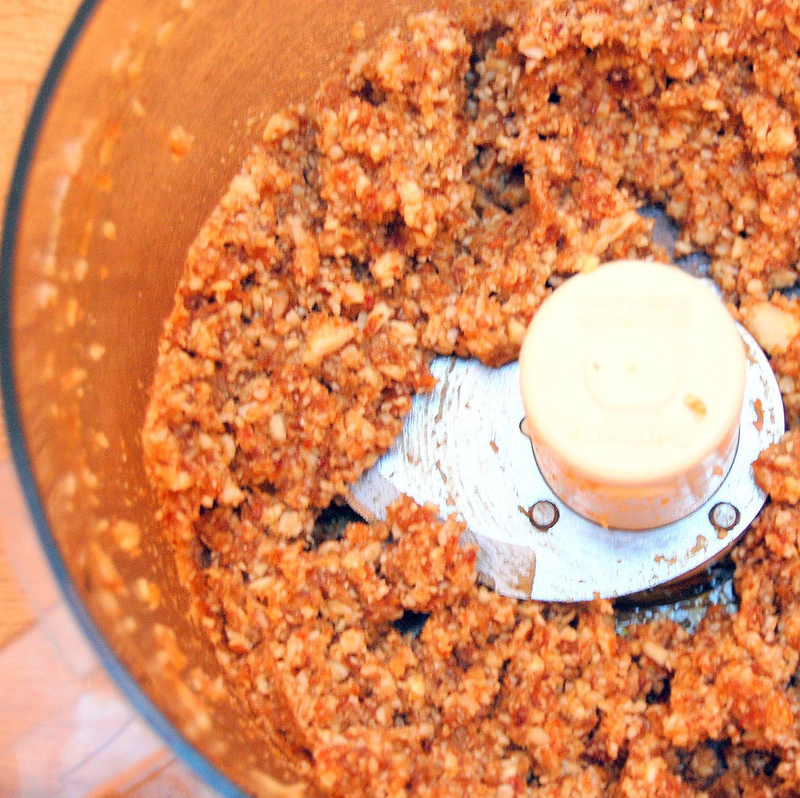 Place the almonds in a food processor with an S-shaped blade and process until it reaches a crumbly consistency. Drain dates and add to food processor with coconut, date syrup and process until the dates are broken down and mixed in well with other ingredients. It should be a thick paste-like mixture. 2. To shape the crust, place crust mixture into a tart pan and shape and mold the crust to the pan with fingers. 3. Chill the crust in the refrigerator for an hour or until ready to use. 1. 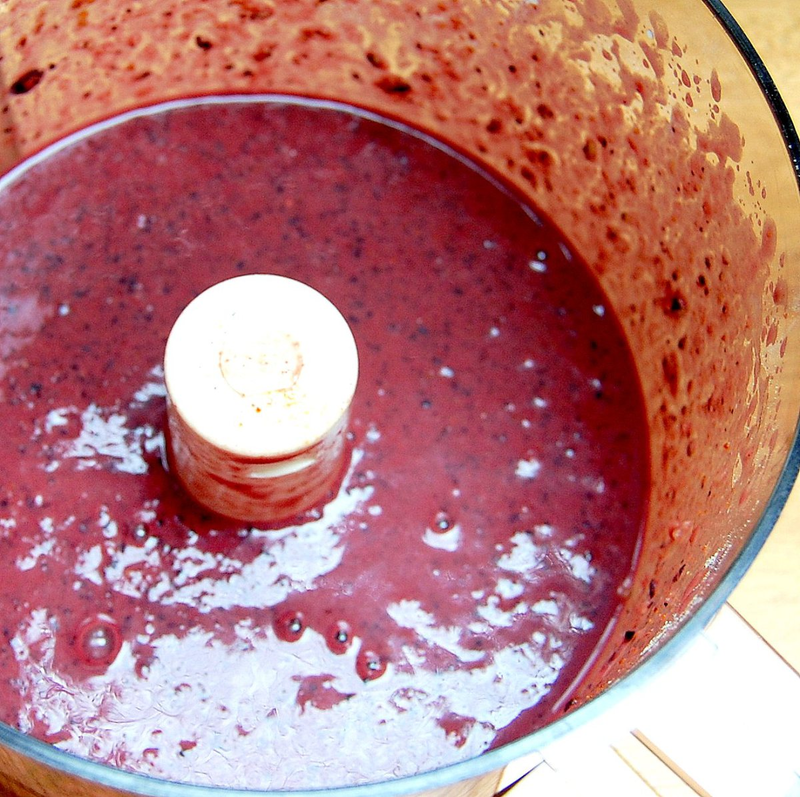 Place 2 cups blueberries, defrosted acai pack, date sugar, coconut milk, vanilla, lemon juice, and tapioca flour in food processor with S-shaped blade and process ingredients until smooth. 2. Place berry tart filling in small saucepan and heat on low to medium-low heat stirring constantly for 3-5 minutes until it thickens to a consistency of pudding. Tart filling should be nice and thick. Allow pie filling to cool completely. 1. Add 1 cup blueberries to saucepan and fold into pie filling until combined. 2. Pour tart filling into prepared tart pan and top with remaining blueberries and sliced strawberries. 3. Place in the refrigerator to set for minimum 1 hour or until ready to serve. This can be made a day ahead. * Note: This crust is a raw crust and will not be the same consistency of a baked crust. When serving, run a knife along the edge of the tart and remove slices with a pie server. Should hold together quite nicely. This would probably work really well in a tart pan with a removeable bottom. When I get one I will try that! This is a work of art! I am hosting Mothers Day brunch in two weeks and will try this for dessert! Stunning tart! Your family is so lucky to have this rocking the table for Easter. Well done! I am so happy Acai has made it from Brazil to the US (I used to only eat it when I went to Brazil!) And I LOVE what you've done with it in this tart! Oh my gosh, is that pie gorgeous!!!! And it looks like it tastes great too! Wendy, you would love this one! Lauren, I would bring you a piece if there was any left. =( I want one too! so beautiful, it must have been hard to cut into. nah! Gorgeous recipe and awesome pictures that make me dream of a slice of it tonight. :-) Thanks for sharing. Lovely! I really need to try that tart crust recipe. It looks so tasty. Thanks for sharing and congratulations on the Top 9! This looks amazing. Congrats on your top 9! Absolutely stunning!! Well done on the top 9! What a beautiful tart!!! Such bright summer colors, so fresh. I'm loving this and have printed it for our summer events. Nicely done! This is a beautiful dessert and excellent presentation! Looks awesome, I have not used tapioca flour before, should be interesting. Thanks for the healthy kids recipe! I made this tart yesterday and it was delicious. This might be one of the best desserts I've ever made, so fresh tasting. I am making this for Mother's Day! Thank you for this fantastic recipe. Your blog is amazing, I'm hooked. I love your blog 🙂 I am following you now! thank you meg and joanna! I have been trying make your crust today. is it supposed to harden up a little while in the fridge. Mine just remained a sticky paste, and I was unable to get it out the form. What did I do wrong? Please give me some advice. I want to make this cake as it looks absolutely gorgeous! This looks completely addictive. Hope I can try it on my husband soon!